First it was Ansel Adams relatives who questioned the authenticity of a garage sale find being linked to the great photographer. Now a woman from Oakland is joining in on the cry of foul. 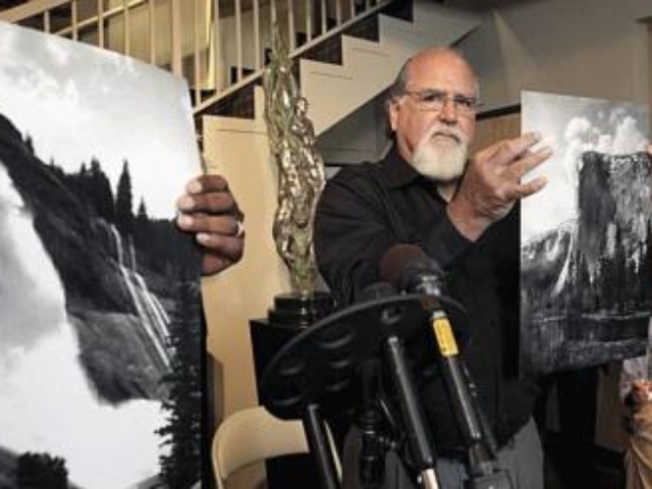 Mariam Walton called the KTVU newsroom after she saw the story on television about the apparent find of old glass slides believed to be taken by Ansel Adams. She said one in particular looked a lot like a photograph her uncle, Earl Brooks, took. That's where Scott Nichols joins the story. Nichols is a San Francisco art gallery owner and Ansel Adam expert. He took a look at Uncle Earl's photographs and said the ones purchased at a garage sale held a striking resemblance. He specifically analyzed one of a pine tree on Sentinal Dome and said because of the placement of the camera and the shadows of the tree, he think the slide was taken by Earl Brooks. Walton said her Uncle Earl lived in Fresno and took countless photographs of places like Yosemite during his lifetime. Walton let Nichols take four of her Uncle's photographs with him back to San Francisco for more study. Nichols is comparing them to Ansel Adams originals, as well as those glass slides found in Fresno. Nichols said he should be able to tell with more certainty whether the slides are new pictures taken by Ansel Adams or Uncle Earl. Of course, this won't be the final chapter of the story. The original experts who authenticated them as Ansel Adams' work haven't weighed in. Even before Mrs. Walton brought her uncle's work into the picture, Adams' grandson, Matthew Adams, who heads the Ansel Adams Gallery in San Francisco, said he found no real hard evidence his grandfather took them. "I'm skeptical," Matthew Adams said. Noone is saying that Rick Norsigian is perpetrating a fraud. They just say he's wrong. Ten years ago, the Fresno painter stumbled upon a trove of 65 old glass negatives that he says have been authenticated as the work of famed nature photographer Ansel Adams, possibly worth $200 million. Norsigian bought the negatives from a man who said he had purchased the box from a Los Angeles salvage warehouse in the 1940s, bargaining the price down from $70 to $45. He saw they were of views of Yosemite but never suspected they might be Adams' works until someone mentioned they resembled the famed photographer's shots.